NewSouth Books would like to congratulate Billie Jean Young on being selected by the Alabama Department of Education and AT&T for inclusion in the 2011 Alabama African American History Calendar as well as being recognized by the Girl Scouts of North-Central Alabama as one of the recipients of the 2011 Women of Distinction Award. Young is the author of Fear Not the Fall, which was published by NewSouth Books. Fear Not the Fall features her play Fanny Lou Hamer: This Little Light. Billie Jean Young is Artist-In-Residence on the faculty of Judson College in Marion, Alabama. The talented Choctaw County native, born July 21, 1947, is poet, author, actor, activist, and educator, and has spent a lifetime merging her various talents into a unique and multi-faceted career focused on the Civil Rights Movement, rural women and Alabama Blackbelt life. Billie Jean Young was educated in the public schools of Choctaw County. She is a graduate of Judson College and she holds a Juris Doctorate from Samford University’s Cumberland School of Law. Young is a prolific writer. 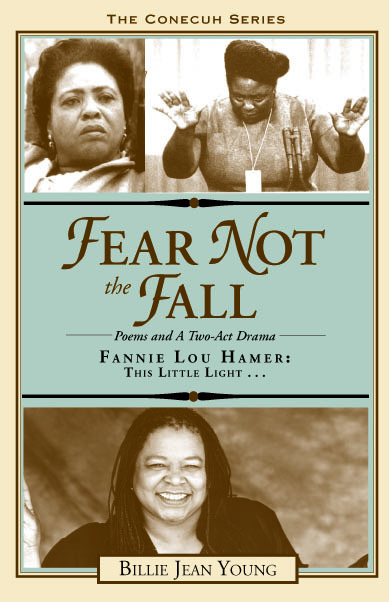 Her book of poems, Fear Not the Fall (2004), includes her one-woman play, Fannie Lou Hamer: This Little Light… which Young has performed for twenty seven years throughout the U.S., and abroad on four continents. Her newest book entitled, Now How You Do? A Memoir (2010) is a book of letters written by an Alabama woman, Susie M. Young, to her daughters. The letters cover a span of thirty years and provide a running commentary on life in the impoverished Alabama Blackbelt. Besides her best known play about Mississippi freedom fighter Fannie Lou Hamer, Young has written and directed several other plays with Civil Rights Movement heroes, among them: Jimmy Lee (2009) which commemorates the contributions of Jimmie Lee Jackson of Perry County, and Oh, Mary, Don’t You Weep: The Margaret Ann Knott Legacy, (2007) which memorializes the martydom of Margaret Ann Knott of Choctaw County. The Girl Scouts of North-Central Alabama also honored Young by awarding her one of the 2011 Women of Distinction Awards. Fear Not the Fall, by Billie Jean Young, is available from NewSouth Books, Amazon, or your favorite local or online book retailer. You are currently browsing the archives for the Fear Not the Fall category.